Mittelaletsch Glacier was a tributary to the Alps largest glacier Grosser Aletsch, until separation in 1990. The map of the glacier represents changes in the glacier from 1926 to 1957, indicating the connection of the two glaciers at that time. 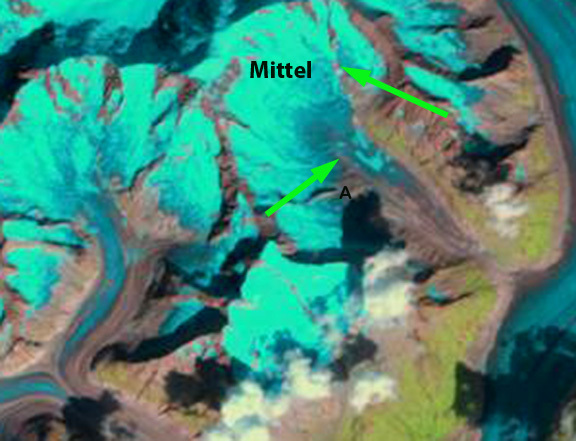 By 1970 Mittel had separated from Grosser, and experienced 420 m of retreat from 1970 to 2000 as noted by the Swiss Glacier Monitoring Network. Map showing 1957 glacier extent with elevation changes from 1926 in yellow. Here we examine changes in the glacier using Landsat imagery from 1990 to 2013. 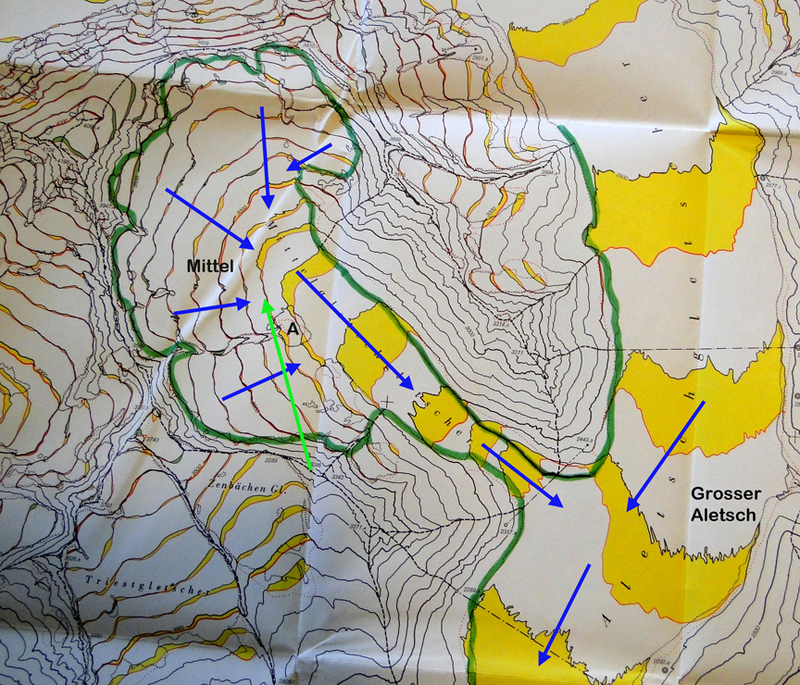 In each image an upper and lower green arrow point to the same location where expanding bedrock areas are separating the upper and lower portion of the glacier. Point A is at the lower end of a prominent rock rib. In 1990 the glacier ends at the red arrow separated from Grosser Aletsch by 600 m. At the lower green arrow the glacier is flowing across this slope contributing snow and ice to the lower glacier. In 1999 the area of exposed bedrock between the upper and lower glacier has expanded by at least 500 m at both green arrows. By 2007 Google Earth imagery indicates a continued expansion at the lower green arrow. 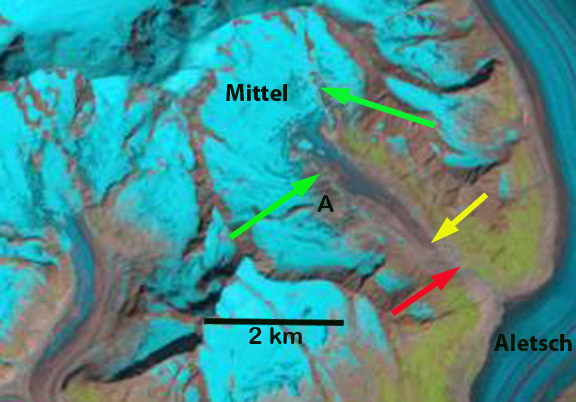 The glacier terminates at the yellow arrow 1050 m from a connection to the Grosser Aletsch Glacier. 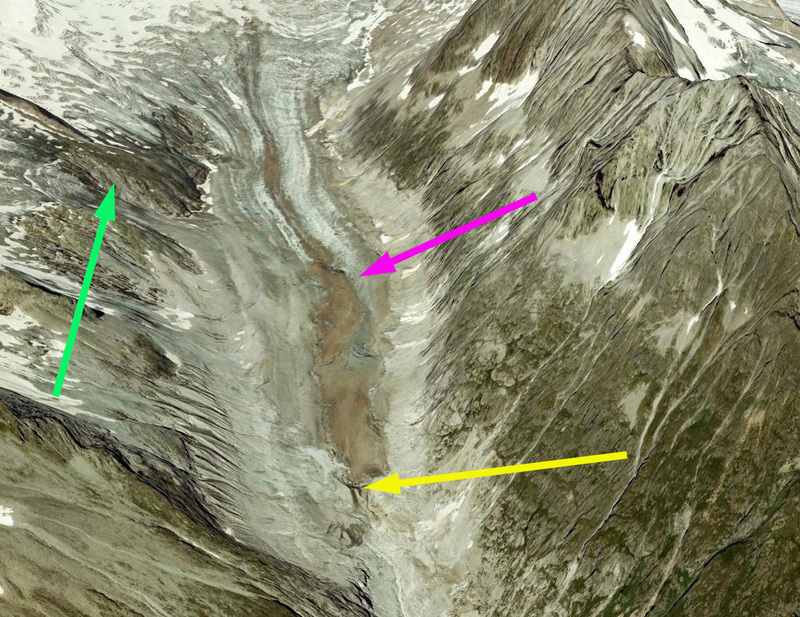 The lower 1 kilometer of the glacier is stagnant as seen in the closeup view of the terminus, pink arrow indicates start of stagnant section. 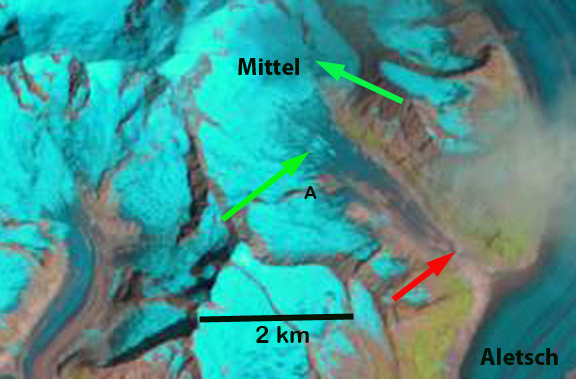 In 2013 the glacier has retreated 1400 m from the Grosser Aletsch Glacier, terminating at yellow arrow versus 1990 terminus red arrow. 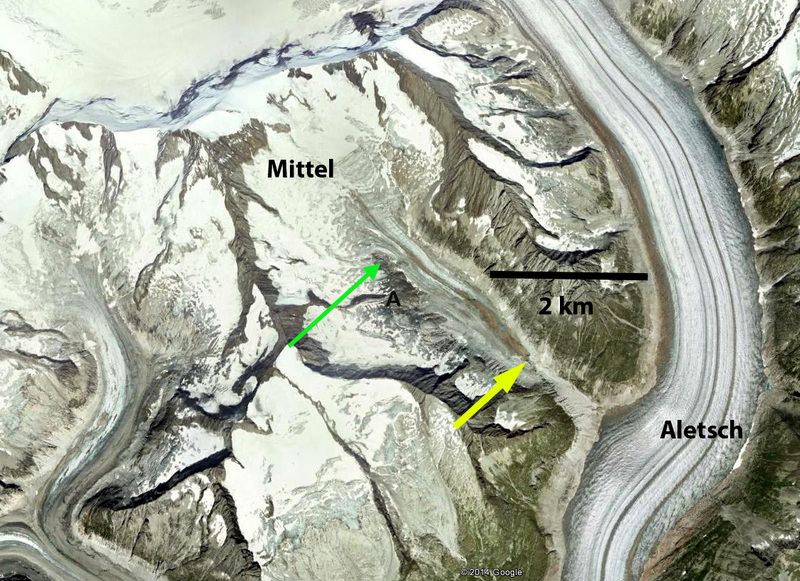 The margin of the Grosser Aletsch has contracted 150-200 m, hence the actual retreat since separation is 1200-1250 m. By 2013 at the lower green arrow the bedrock strip separating this section of the upper and lower glacier has expanded to a length of 1 km. This is equivalent to a company losing income from an important division, or a family losing one income stream. The lower glacier is recieving less snow and ice contribution and will continue to retreat, quickly loseing the stagnant area the comprises the lowest 700-100 m of the glacier. Jouvet et al (2011) reconstruct the behavior of the Aletsch Glacier system to various climate scenarios and find that any scenario leads to 2 km of retreat by 2040 for Grosser Aletsch and somewhat less for Mittelalestch. This glaciers behavior is similar to that of nearby Gauli and Oberaar. This entry was posted in Glacier Observations and tagged Aletsch Glacier retreat, aletsch glacier separation, mittelaltesch glacier retreat, swiss glacier climate change, swiss glacier retreat. Bookmark the permalink.